The Parkinson’s program at Cypress Palms provides a sense of achievement and enhanced control over our participants’ symptoms. We offer a proprietary, three-tiered Parkinson’s program that focuses on education, exercise and wellness, and support. We call this the Cypress Alternative. Its design and implementation have earned us the distinction of being a “provider of choice” for those living with Parkinson’s disease. We are the only assisted living facility in Pinellas County with the Parkinson Proficient Accreditation for Exemplary Service Programs and Team Training by the Parkinson Foundation of the Heartland. Cypress Palms staff personnel participate in a 9-module training program called the Parkinson’s Care series in which each team member receives training appropriate for their respective role in resident care. We conduct daily exercise and social programs specifically designed for the needs of those with Parkinson’s disease. We also offer monthly support group meetings for residents and their families. Rock Steady Boxing enables individuals with Parkinson’s disease to fight their disease by providing non-contact boxing-style fitness programs that improve their quality-of-life and sense of efficacy and self-worth. Recent studies also suggest that intense exercise programs may be “neuro-protective,” actually working to delay the progression of symptoms. Rock Steady Boxing provides encouragement by inspiring maximum effort, speed, strength, balance and flexibility. Boxing works by moving your body in all planes of motion while continuously changing the routine as you progress through the workout. 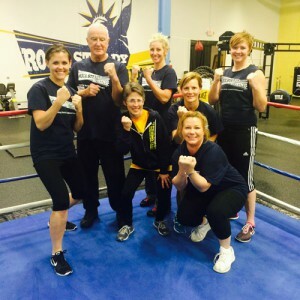 Rock Steady Boxing classes have proven that anyone, at any level of Parkinson’s, can actually lessen their symptoms and lead to a healthier, happier life. Classes: Rock Steady Boxing at The Palms of Largo offers four different levels of classes to accommodate varying degrees of Parkinson’s fitness. Support: The Parkinson’s Support Group meets on the 3rd Tuesday of each month from 12pm to 1:30pm at Cypress Palms located at 400 Lake Ave NE, Largo, FL 33771. Parkinson’s Program Facilitator is Leah Einboden (727) 385-9881. Contact: Rock Steady Boxing at (727) 518-6008 or (727) 385-9881 to get signed up or to learn more. On National Senior Health & Fitness Day, Rock Steady Boxing at The Palms of Largo set a goal to throw 10,000 punches to fight Parkinson’s disease. With the help of residents, staff, and Rock Steady Boxing participants, we surpassed that goal with an unbelievable 35,884 punches in total! In Pinellas county, more than 5,000 people are affected by Parkinson’s. With efforts such as these, we are working to diminish the symptoms of the disease to help people live happier, healthier lives. Read the article and watch the video here. Boxing classes, taught by Certified Rock Steady Boxing Coaches, include an exercise program that attacks Parkinson’s at its vulnerable neurological points. While focusing on overall fitness, strength training, reaction time and balance, workouts include: focus mitts, heavy bags, speed bags, jump rope, core work, calisthenics and circuit weight training. No boxing experience is necessary and people of all ages are invited to participate. Boxers, both male and female, range in age from mid-30s to early 90s. Head Coach, Ian McGarrity, has been training individuals with Parkinson’s disease for over 15 years. Ian has a positive and holistic approach to coaching we are sure you will love! Our Parkinson’s program director and support group facilitator, Leah Einboden, has been working with Parkinson’s for over 4 years. Leah’s passion and enthusiasm for improving the quality of life for those with Parkinson’s shines through her coaching. Dianna Slutzker is the Director of Nursing at Cypress Palms for over 10 years and has worked with Parkinson’s throughout her long career in nursing. Dianna is dedicated to helping all Parkinson’s participants with her clinical knowledge enhancing her coaching skills.